"The space is evolving quickly," Coke (KO) said. "No decisions have been made at this time." Coke's interest was first reported by Bloomberg, which said the company was in talks with Aurora Cannabis, a Canadian cannabis company. Aurora has also expressed interest in cannabis drinks. Neither would comment on a possible deal. 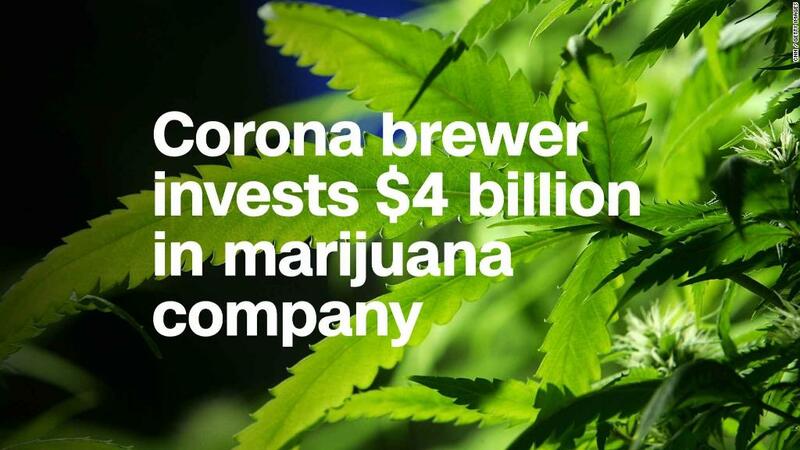 Constellation Brands (STZ), the maker of Corona beer, Svedka vodka and Casa Noble tequila, announced last month that it is investing an additional $4 billion in the Canadian cannabis company Canopy Growth (CGC). A number of Canadian cannabis companies, including Cronos (CRON) and MedMen Enterprises (MMNFF), now trade on US stock exchanges, and some American companies have taken stakes. And Lagunitas, a craft beer label of brewing giant Heineken (HEINY), already has a drink infused with THC, marijuana's active ingredient, which does produce a high. It can be purchased at marijuana dispensaries in California. Both cannabis and CBD are still illegal in the United States under federal law, even though a number of states have legalized marijuana. But the prohibition against CBD is not strictly enforced. There are third-party sellers offering CBD-based products on Amazon (AMZN), for example. Still, it's unlikely that a major company like Coca-Cola would offer a product infused with CBD in the United States until the federal law changes, said Kris Krane, president of 4Front, a firm that advises companies on the legalities of marijuana and an expert on cannabis law. He said he would expect that Coke would develop the product first for sale in Canada, readying it for the United States once it's legal. "I can't imagine they're doing it just for the 35 million people in Canada, they clearly have an eye on the US market," said Krane. Coke could be well positioned to capture market share should CBD and other marijuana products become legal, said Bonnie Herzog, analyst with Wells Fargo. She said in a note to clients Monday that Coke is positioning itself for the long-term. She estimates that cannabis-infused drinks could become a $50 billion annual market in the United States -- nearly half the size of the $117 billion market for US beer sales.